Villa Michaela has a fabulous location in the small town of Akrotiri, close to a range of amenities while the capital Fira is only a short car journey away. 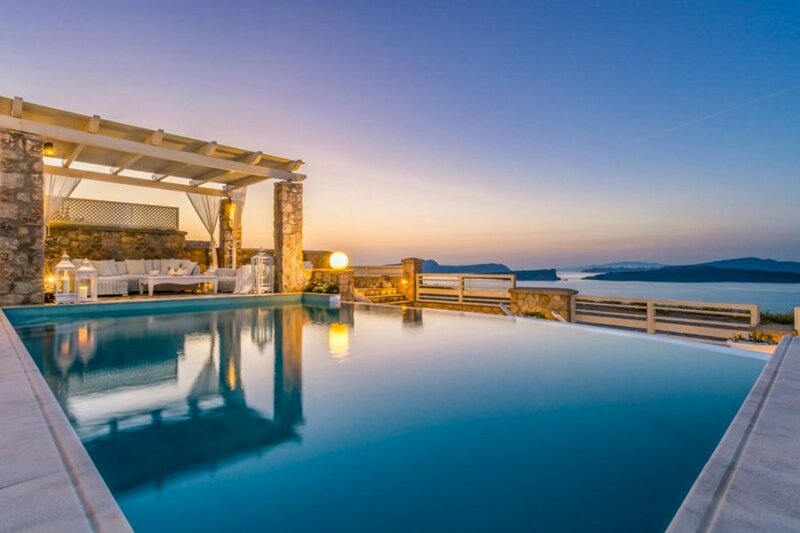 The villas fantastic positioning allows guests to enjoy impressive views of the volcano and caldera, while the old Castle of Akrotiri can be seen from the outdoor dining area. The villa has been beautifully and lovingly designed with elegant furnishings, wooden ceilings and colourful paintings and ornaments. On the ground floor is the living and dining area along with a fully-equipped kitchen area complete with cosy corner seating area. Also on this level, is one of the queen-size double bedrooms complete with vanity area and one of the three bathrooms. Upstairs, on the first floor is a further two double bedrooms, one of which has its own loft area complete with an additional double bed. There is also a basement area, which boasts the remaining two bedrooms along with a bathroom and spa room with indoor heated jacuzzi. Outside, the large private pool is the perfect spot from which to soak up the tranquil surroundings. There is also a dining area complete with barbecue which is fantastic for al fresco dining or simply enjoying a glass of wine while watching the sunset.